The Great Scallop Search of 2017 launches from the Sarasota Sailing Squadron, 1717 Ken Thompson Pkwy, Sarasota, FL 34236. For boaters interested in searching the Northern Bay and Manatee County, you can arrange pick up their maps and materials ahead to time. Please indicate this choice on the registration form below. 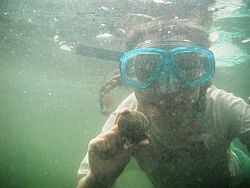 Purpose of event: Help to monitor annually the number of scallops in Sarasota Bay waters and support scientists at the Florida Wildlife Research Institute (FWRI). What to bring: Sunscreen, hat and sunglasses, mask, snorkel, fins and water shoes. Reservations are required to participate in the event. Space is limited, Boats limited to 50, kayaks welcome! No boat? Sign on as a crew member and you will be placed on a boat, space permitting. Participants will be equipped and trained on how to search for scallops in seagrass. Experts from the Fish and Wildlife Research Institute (FWRI) will be on hand to answer questions and there will be a touch tank on display. HISTORY: Scallops have been largely absent from Sarasota Bay waters since the 1960’s due to dredging and land development (the Florida Land Rush), the accompanying population boom and associated water quality issues. Today there have been improvements in water quality and a resurgence of seagrass beds to levels that may once again support these important bivalves in Sarasota Bay.